Years ago, we were about to move to India to work a significant amount of time in slums, orphanages, and villages. Somehow, not long before I left, a beauty mark on my face above my lip got scratched and began to bleed. Because it had happened before, I went to a doctor. The doctor recommended that I have the mole removed so I would not have to worry about infection while living for an extended time in Asia. Before I left his office, I lost the beauty mark and gained a noticeable scar. Recently I have thought more about scars and realized that over the years I have an actual “scar worldview”. Crazy huh? I think scars can reflect a life lived well in a fallen world. 1. Scars can reveal character. My little sister has loads of scars due to years of uncontrolled seizures. Many of these scars are on her face due to drop seizures. But I don’t see imperfection on her chin where so many scars reside. I see strength of character. I will never forget watching a mom fret and worry over a tiny little scratch on her daughter’s face and whine, “Ohhhh, I hope that doesn’t leave a small scar on her face!” I felt a sudden sadness hearing this conversation. Desired perfection and an intense focus on outward appearance may result in a flawless complexion but might reveal flaws of the heart – in the area of character where true beauty resides. 2. Scars can reveal a life lived with purpose. My oldest daughter has a big scar on her elbow from a surgery for congenital radial head dislocation. Our daughter traces this scar to a powerful story about her beginnings. While living in India during our first trimester, I became very sick. During that time, my placenta pulled away from my uterus. While all this trauma took place, critical development was taking place. But the sickness interrupted “perfection” and her radial head dislocated and also caused congenital scoliosis. We tell our daughter she is a survivor and hung on like a rock climber. When I see her scar, I often think of scars that we incur by simply engaging deeply with life and in life. I am not sure, but so far I think my daughter is pretty proud of this scar. When she sees it or points it out to others she says, “Mommy says I was like a rock climber insider of her; I held on tight.” To her, this scar proves her “survival skills” and how she is a miracle because God obviously has a plan for her life – she has purpose. I personally cannot wait to see the nail-scarred hands and feet of Jesus. Those scars bought my salvation. They are beautiful. Believers around the world carry the scars of walking after Jesus. And like Amy says, if we don’t have scars, are we really following Jesus that well? 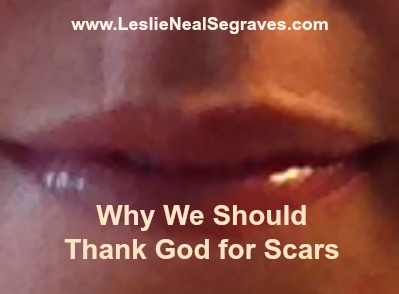 Scars – either emotional or physical- exist for those who follow Christ well. Jesus promises them. So over the years I developed a scar worldview. I guess that’s why my noticeable scar just never has really bothered me. But lately, I realized I never actually told Jesus thank you for the scar above my lip. But now I have because we recently adopted a little baby girl from China with an unrepaired unilateral complete cleft lip and palate. In just 21 days, she will have her first surgery which will result in a scar above her lip. Isn’t it true that life sometimes seems more bearable when you can either lean in on someone with a similar burden or can help someone with a similar burden? Our struggles – our scars – help us relate to others with more empathy. Paul encourages us to use our scars to serve others. God comforts us in our troubles, so that “we can comfort those in any trouble with the comfort we ourselves receive from God” (2 Cor. 1:4). I continue to find that I can relate and minister to people better when I myself have struggled with similar problems. And for the opportunity to relate to others in their pain, we can actually find ourselves thanking God that we can minister to others through a depth of understanding. So though I can’t relate exactly to Phoebe and what it’s like to be born with a cleft lip and palate, I do know that she and I can gaze into a mirror while looking at our scars above our lips. Together we can share our stories of character, purpose, and what it means to live for others – even when it hurts. And for the coming days of scar gazing in a mirror with my daughter while helping her develop inner values, I am ever so grateful for the literal scar above my lip. Join the Conversation: What have you learned by allowing your scars to help you comfort others?